This program involves nine distinct hands-on practices that integrate classic financial wisdom into daily financial activities. These practices are a bit like parts of a DNA spiral – they are the building blocks of a contented life. They are interconnected and interdependent, each one important to the whole. How you put them together is up to you; they are not linear like ladder steps. Yet they do work most efficiently when done in a certain order. Even if you do only one of the steps, we guarantee you will get something out of it. But why stop with just one? Just as all the spokes of a wheel are important to moving forward smoothly, so it is with the steps. When you give equal weight to ALL the steps, you can go to amazing places very quickly. And when you discover how well they work for you, you will move through them over and over again. 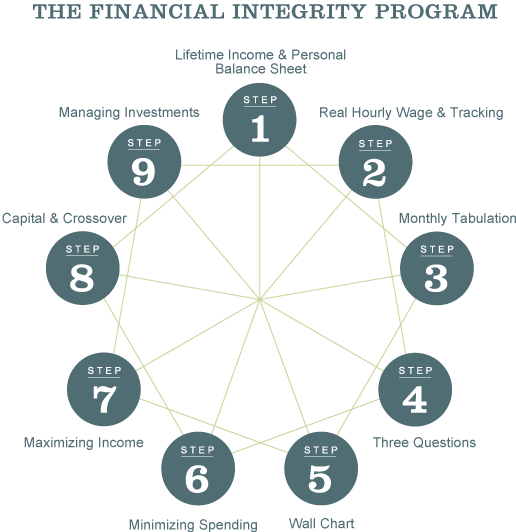 To really understand how to do the program, download the Financial Integrity Program Guide. But for a quick overview of each step, explore the links below.